If you're anything like me, you get that these are about as useful as a screen door on a submarine. Sure, the concept is lovely. New year. New start. New you. Not me. It's too much pressure. I'm not a big fan of setting myself up for failure. I like to give this old gal more realistic approaches, like adding more veggies to my salads or going to bed an hour earlier three days a week or even incorporating more green drinks into my morning routine, although I've already failed epically on that one the second day in. I've spoken to several friends of mine and, sadly, their 'Going-To-Climb-Mount-Kilimanjaro-While-Learning-to-Knit-On-Skis' resolutions are already down the toilet less than 4 weeks into it. So what do we do? We celebrate with margaritas and Mexican food. Support is very important in times like these. 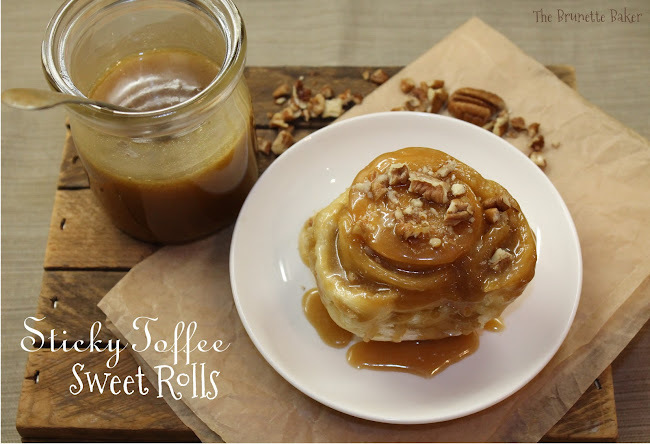 These sweet rolls are where it's at. This is one treat you will want to keep very handy in the recipe repertoire. And one that is definitely worth breaking a resolution or any diet for that matter. Just ask my yoga pants. Grease the inside of a large mixing bowl. In another mixing bowl, combine dry yeast, warm water, and 2 tablespoons sugar. Stir slightly and allow to set for about 5 minutes. If your yeast doesn't 'bubble', it's no longer active. You'll need to get fresh yeast. In a medium saucepan over low heat, allow milk and butter and allow to come together. Remove from heat and add in the remaining ½ cup of sugar and salt. Once everything is combined, pour butter mixture into yeast mixture. Add eggs and 1½ cups of flour. Mix well. Stir in an additional 3 cups of flour to make a soft dough. Turn out onto lightly floured board; knead until smooth and elastic. Add extra flour as needed or until dough is no longer tacky. Place dough into prepared greased bowl and cover with a tea towel. Depending on what season you are making these and where you live, I like to place the bowl in the oven with the light on. The light from the bulb provides the oven with just the right amount of warmth for it to rise. Allow it to set for about an hour or until dough doubles in size. Once the dough has doubled, punch in it, and allow to set for about 10 minutes. In the meantime, make toffee sauce. In a large saucepan over medium-low heat, melt butter. Add in brown sugar, syrup, and salt. Simmer for about 3-5 minutes. Add heavy cream and rum, if using. Simmer for another 3 minutes and remove from heat. Pour half the sauce into a 9x13 baking dish. Set aside. Turn dough out onto a lightly floured surface. Using a rolling pin, roll out dough into a rectangle. Brush dough with melted butter and sprinkle with sugars. Carefully and tightly, roll up edges from one end to the other. Cut into 2, 3, or 4 inch pieces, depending on how big you want your rolls to be. Place rolls into dish prepared with toffee sauce. 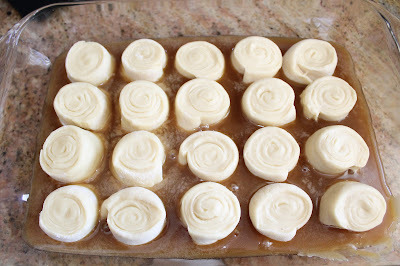 Toffee sauce should cover about half the rolls once placed. Cover with a tea towel and allow to rest for 30 minutes. They will get bigger in size. Preheat oven to 350ºF. Bake rolls for 25-35 minutes or until they are golden brown. Remove from oven and allow to set for several minutes. 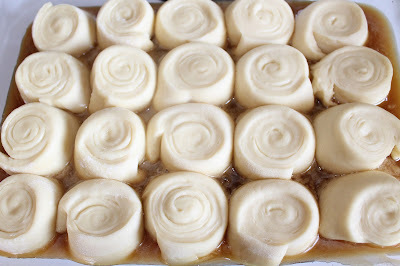 Turn out \rolls onto a serving dish, taking care as both toffee sauce and pan will be very hot. Serve warm. Add pecans or raisins if you wish, but these are fantastic as is. Oh my. You are seriously tempting me with these. I have such a weakness for yeasty buns and sticky caramel. Will try these soon! These have to be the best looking rolls I have seen in a long time! Holy Cow! Thanks for sharing at Show Me Your Plaid Monday's! We just found your blog. You have a great blog with yummy recipes. These look delish, great pics too. Um, my mouth is actually watering. I want my house to smell like these asap.